Torjoman is a leading online translation agency, with three offices spread across UAE, KSA and Egypt, that translates documents, websites, apps, multimedia and much more. Our mission is to act as a guide between our clients and their markets. We break boundaries and push for understanding in 100+ languages. We support the international business cycle in any industry on all levels – from legal translation services to marketing and website translations and localization. Why Should I Choose Torjoman? What are the services provided by Torjoman? We offer document translation for all subjects. – all of which can be customized for: web, mobile, software, marketing materials etc. editing and bilingual review of the target language to check for omissions and mistranslations that may not be appropriate. All our proofreaders are in-country linguists and native speakers with full command over target language and fluency in the source language.For more information. Our Multilingual DTP services comprise of a team of highly skilled desktop publishers, translators and graphic designers. We create online and print-ready localized materials for you which authentically reflect the original. We have the best interpreting solutions customized to your business needs so that you don’t worry about technical and language barriers. We have an extensive team of certified professional interpreters who can interpret more than 100 languages in all situations such as consecutive, simultaneous or face to face interpretation. With years of experience working with top companies in both entertainment and media industries, we have developed unique expertise in multimedia translation services. We have developed a specialized division that offers high quality multimedia translation services including dubbing/lip-syncing, subtitling and voice-overs in 100+ languages. We offer our services in more than 100 global languages. We engage only native speakers who have full command over their respective languages to ensure that you get the best quality of service. How do I place my order or project? Hiring us for one of our services is very easy. You can fill out an order form here. Once submitted, our team will review your order and get in touch with you. After the order is confirmed and all details have been exchanged clearly, we will ask you to clear payment. Once the payment is received, we will proceed to work on your order and submit on the agreed timeline. If you wish to get an estimated quotation for your order before hiring us, simply sign up on our website and get a free quotation Sign up. What is the difference between translation packages? We understand that no size fits all. We have three packages to suit our clients’ requirements. You can choose from Economy, Standard and Premium. Yes, we offer exclusive rates to our big clients that are simply unbeatable. Offload all your translation projects to us and experience high-quality, speed and translation accuracy at unbelievable rates. For more information, please read this. What subjects and industries does Torjoman work on? Our services encompass all subjects and fields including but not limited to software, marketing and advertising, IT hardware, business, automotive, medical, legal and contracts, educational and learning, travel and tourism, accounting and finance, sports, certificates and licensing, technical and engineering. Not what you’re looking for? Get in touch and we will work it out. Which Translating materials types are available? You can get localized translations for legal, technical and commercial documents and more – all of which can be customized for: web, mobile, software, marketing materials such as Brochures, Leaflets & flyers, Email marketing translation, Advertising copy, Presentations, Press releases, Catalogues, Packaging, Websites, Newsletters, Tweets, Social media posts, blogs and more. Which files and formats are supported? Can I choose a layout for my project? Desktop publishing and layout specification is a critical element in a translation project as its quality can affect the tone, sense and visual aspect of any set of localized materials. We optimize your documents so that they align with the languages and typographical standards of the target country. 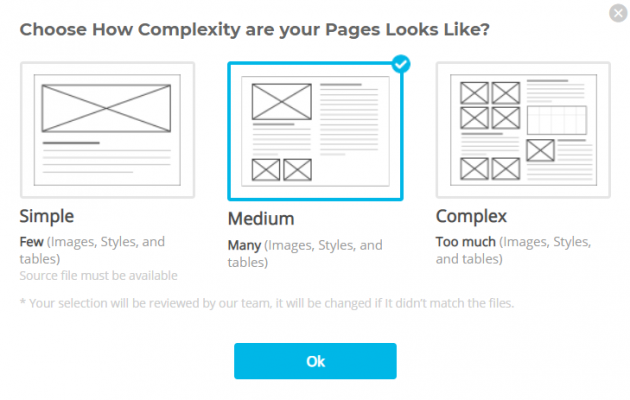 While placing your order, you can also choose the level of layout complexity and then continue to give out more details about it. 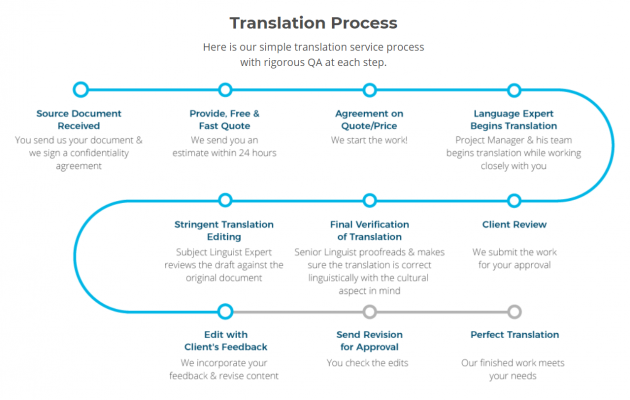 What is the translation quality process? Our 2 step vigorous translation quality process ensures that you receive submission error-free, flawless and of highest quality. We have completed over 9500 projects in more than 100 languages. We are certified translators with highest authority certifications in UAE, KSA and Egypt. Do you offer proofreading service? Yes we offer proofreading service. Proofreading service is more than a review of one text copy for accuracy, grammar, spelling and style check. It includes editing and bilingual review of the target language to check for omissions and mistranslations that may not be appropriate. All our proofreaders are in-country linguists and native speakers with full command over target language and fluency in the source language. For more information about proofreading, please read this. We accept all major credit and debit cards, PayPal, Cash and Bank Transfers. Your translation project begins once we have received your order and you have approved the quotation, timelines and details of the project with us. After that we will begin translating as soon as we receive the payment. Can I give special instructions about my project? Our order form here is very detailed. We have covered all aspects of a translation project but if there are special instructions that you want to give, you can do so in the bottom of the form. You can write any kind of detail for our review. We love to accommodate custom requests of all our clients so you are welcome to give special instructions to the translator about your project. Once we begin your project, you can track the progress through your dashboard. You can also download our mobile application and directly track the progress of your project from your mobile phone. We work and deliver in a number of file formats. While placing your translation order, you can mention the format you want to receive your translation in and we will deliver in that format. Is it possible to receive the translation in the same layout of the source file? Yes it is possible to receive the translation in the same layout of the source file. When placing your translation order, be sure to check the page layout textbox. You can also upload the source file if it is available in the order form and we will send you the translation in the same layout.